DECEMBER 2016 – On Friday, December 16th, we will welcome Gregg L. Semenza and William G. Kaelin to present at the Johns Hopkins Bayview Research Symposium. 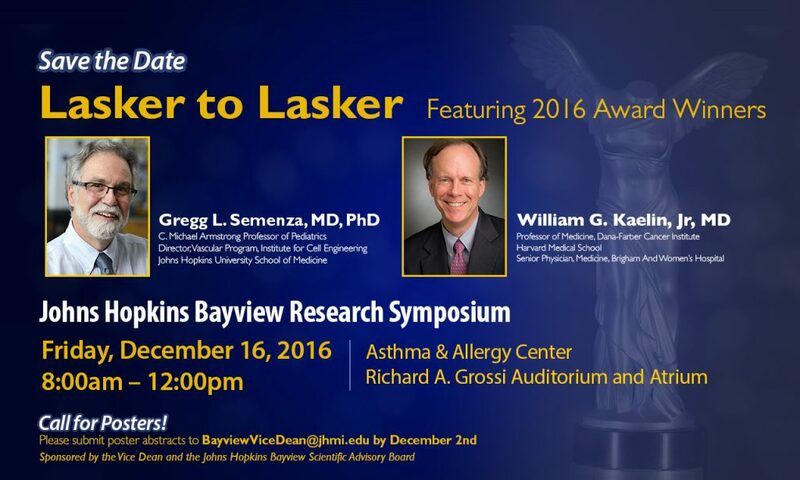 These two brilliant physicians both won the Lasker Award this year and we are thrilled to have them coming to Bayview. Mark your calendar, save the date, and join us for a symposium to be remembered! NOVEMBER 2016 – The Corrie Health team, led by CIM Member and 3rd Year Bayview Resident Francoise Marvel, along with faculty mentor Seth Martin, recently received the award for Best Pitch at the Fueling the Growth with UberPITCH competition in Stamford, Connecticut. The team was one of 150 of the 300 applicants across the country to take a 15-minute Uber ride with investors to present their ideas. They were then named one of the 25 semifinalists from 5 major cities to travel to Connecticut, and became one of five companies to receive $15,000 in funding. An audience of over 150 investors, entrepreneurs and service providers voted theirs the best pitch, earning them an additional award of $1,500. The team’s success proves that Corrie Health was seen as an innovative solution for heart attack recovery with an addressable economic problem of costly readmissions, a humanitarian gain of reducing avoidable harm/death post-heart attack and a brain trust of Johns Hopkins with Apple collaboration to drive the success. SEPTEMBER 2016 – Medicine for the Greater Good was featured on the front page of the DOME, a publication for the Johns Hopkins Medicine Family. To read the full story, click here. AUGUST 2016 – Medicine for the Greater Good is all about community engagement and continues to draw more attention for its accomplishments! MGG was recently covered by Johns Hopkins Medicine with a YouTube video released – check out the full video below. 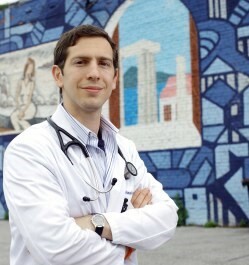 You can learn all about MGG and hear what other doctors have said about this grassroots effort to improve Baltimore’s health. 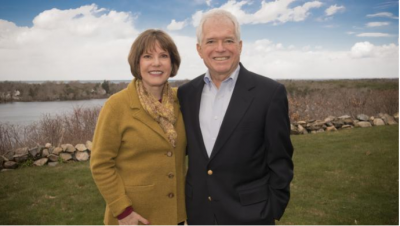 JULY 2016 – Center for Innovative Medicine International Advisory Board Member Claudia Serwer and her husband Michael Skol were recently featured in a publication for Rising to the Challenge: The Campaign for Johns Hopkins. The article tells the story about how a life-saving experience at Johns Hopkins inspired a generous commitment from their estate to the Johns Hopkins Center for Innovative Medicine. Read the full story here. JUNE 2016 – The Center for Innovative Medicine was born at Johns Hopkins Bayview; while we are always thrilled when our projects such as the Aliki Initiative and programs like medicine for the Greater Good have impact on other Hopkins locations, at its heart, CIM is at Bayview. During a Grand Rounds presentation at Johns Hopkins Bayview Medical Center, U.S. Rep. Elijah Cummings reminded a rapt audience: “Never underestimate what you are doing here at Johns Hopkins Bayview. The world is looking at you.” He spoke about a promising future for Baltimore communities thanks to effective programs, such as the medical center’s Medicine for the Greater Good campaign. Read more about what he had to say and watch the recording of his lecture. MAY 2016 – After receiving kind words Congressman Elijah Cummings earlier this year, we are thrilled to announce that he will join doctors, medical students, residents, researchers and outreach workers at Johns Hopkins Bayview Medical Center on Tuesday, May 31, 2016, at noon for a conversation about the “Medicine for the Greater Good” medical health screening and wellness program serving inner city Baltimore. The event is open to the public but space is limited. For more information, please read the press release here. For this Medicine for the Greater Good symposium, we welcome the Hopkins community as well as the people of Baltimore to attend. APRIL 2016 — Co-Founder and Director of Medicine for the Greater Good, Dr. Panagis Galiatsatos, was featured in the Baltimore Sun with his Op-Ed entitled “To treat a community, we must understand its needs”. In this article, he discusses the genuine issues that deter people in the community from seeking medical care. This ideal aligns closely with the Center for Innovative Medicine’s mission to make medicine a better public trust. 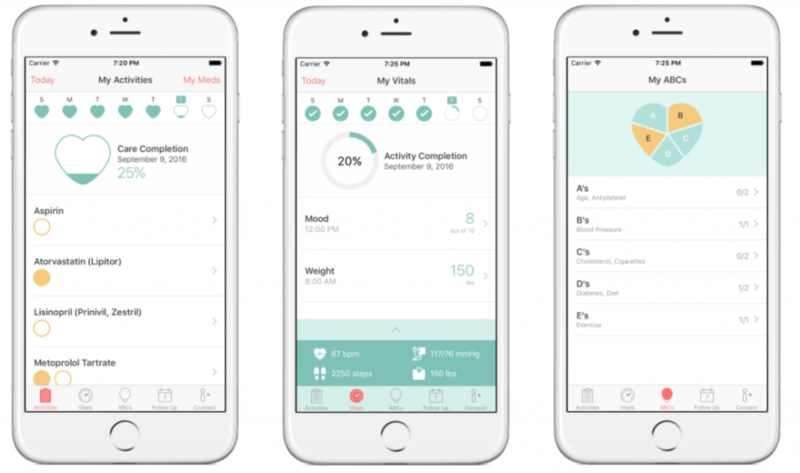 Many notions like health identities come off as sounding complicated at first, but at the heart of it, it is all about teaching people how to live healthier, and when to come and seek medical attention. 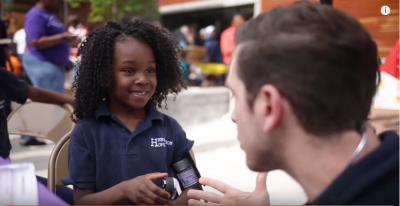 MARCH 2016 – Medicine for the Greater Good has been active on Bayview and in the community with their various efforts to bring health initiatives beyond the hospital walls. MGG recruits interns, post baccalaureates, and undergraduates to participate in their projects on a volunteer basics. 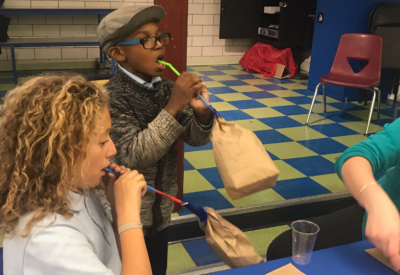 One of their recent projects, the “Beats n’ Breathe” initiative, they’ve used music as an engaging tactic to teach school children and parents about asthma. With these impressive projects in mind, we’re announcing Medicine for the Greater Good Week, from May 24th through May 31st. 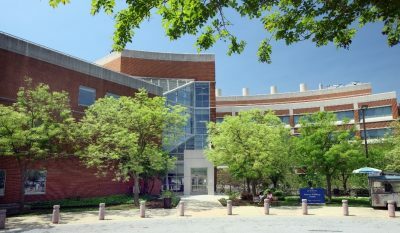 The Center for Innovative Medicine will host “Medicine for the Greater Good Week” later this spring and will feature poster presentations and keynotes from Leana Wen, MD, Health Commissioner for Baltimore City, and Congressman Elijah Cummings. For more information or to participate, please email MGG@jhmi.edu. JANUARY 2016 – Johns Hopkins Bayview is eager to care for their patients, but continues its efforts with Medicine for the Greater Good and the surrounding community. 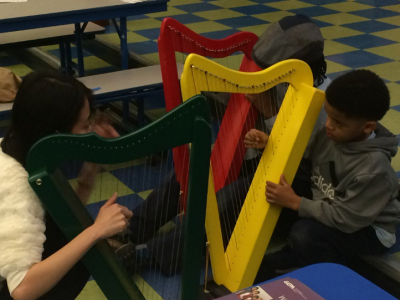 With 2015 wrapping up, we’re setting goals for the new year. U.S. Congressman Elijah Cummings contacted Mr. Ron Peterson, President of Johns Hopkins Hospital about the Medicine for the Greater Good efforts at Bayview. Congressman Cummings was impressed with the recent article that MGG had featured in the Baltimore Sun. Read on to learn more!